April Parker Jones Bruce Boxleitner Chyler Leigh David Ajala David Harewood DCTV Eric Carrasco Jesse Rath Kevin Smith Mehcad Brooks Melissa Benoist Morgan Glennon Nicole Maines Rebecca Johnson Rob Wright Sam Witwer Supergirl Supergirl Radio Supergirl Season 4 The CW Warner Bros TV. Everything is a matter of interpretation I suppose but I think Kara’s line about her father being Agent Liberty was her being intentionally silly. She was just trying to wind the Children of Liberty up. It was her roundabout way of saying “take me to your leader”. Also the fact that she brought up that she knew Agent Liberty was in the area made them more likely to kidnap and interrogate her than (attempt) to kill her on the spot. They already knew or at least believed she was an alien because of the dogs. You could read the scene as stupid but I just read it as Kara being playful/jokey in a tense situation. It’s a fairly common trope. Spider-Man is probably one of the worst offenders. One thing I liked about this episode was Lydia Lockwood siding with her husband. One podcast I listened to thought it was cliche and that she should have been the voice of reason condemning her husbands actions. I think either way it would have been cliche. Nearly every review and podcast prior to this episode seemed to think she would be the voice of reason that persuaded her husband to change his ways. I like that people didn’t see this coming. I didn’t know for sure but I suspected the writers might go in this direction. 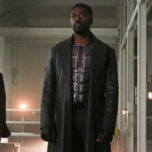 I have to defend J’onn a little bit over the Lockwood home issue. In the fight that led to their house catching fire he very likely saved their lives. The Daxamite invasion was taking place all across the city and he had to fly off to deal with other more immediate threats and save other lives. Also the fire didn’t really seem to flare up until after he had flown off so he probably wouldn’t have realised. Finally fire is a Martian’s greatest weakness. Powerful as he is I’m not sure there was much he could have done about it anyway. All that said I still get the Lockwood family trauma and why from their point of view it would be hard to be understanding towards J’onn after watching their home burn to the ground. I suppose you could read Kara’s use of Liberty’s name as her being playful, but I still maintain that she didn’t exactly know anything about him (because the DEO didn’t know much). In her DEO world, agents are known by their last names. Agent Schott, Agent Danvers, Agent Dox…so it makes sense to me that Kara would have genuinely thought that his last name was truly “Liberty” (when in reality, it’s actually Lockwood). Lydia seemed upset about the whole situation, but she has stated in the past, that she thinks of Ben as a hero. HER hero. She’s also been with him through all the devastation and tragedy they’ve experienced (the destruction of their home, the steel factory closing, and the death of her father-in-law). I’m not surprised that she would choose to stick by her husband. I think the point of the scene from “Man of Steel” was that while Martian Manhunter *did* save the Lockwoods during the Daxamite invasion, his heroism still had consequences that the Lockwoods had to live with, long after J’onn was gone. Thanks for commenting with your thoughts! I’m not trying to be argumentative so I won’t go on about this too much more but I did just watch that scene again before writing this comment in order to re-evaluate my interpretation. 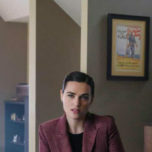 Kara goes up to the people she believes to be Children of Liberty and starts a spiel about how she signed up for a service to do a DNA test to try and find her biological father and that she has come there to meet him. She’s talking rubbish the whole time. Saying Agent Liberty is her dad is just a way to get their attention and gauge their reaction. I don’t for a second believe she thinks his first name is actually Agent. It’s a coin toss whether or not she believed his last name was Liberty although I’m inclined to think she didn’t. I usually download and then listen to various podcasts including yours whilst I’m out walking for exercise. Every now and then I’ll hear someone say something and think “that’s not quite right” and want to counter or suggest a different interpretation but I can’t until I get home. I think to myself that I’ll write in a response when I get home and by the time I do I’ve usually forgotten about it. It occurs to me that a handful of times over the years I’ve been listening to Supergirl Radio that you have taken something a character has said far more literally than I have. This isn’t the first time I’ve thought my interpretation of a character interaction was different than yours. I think we had a similar exchange to this one in the comments below a previous Supergirl Radio podcast but I can’t remember which one. I’m a very literal minded person myself but I believe I’ve gotten better over the years at spotting things like sarcasm and facetiousness in media. Especially in TV and movies. The written word such as Twitter can sometimes be harder to parse. Let me ask you this. If you watch that scene with the thought in mind that Kara doesn’t think Agent Liberty’s real name contains Liberty or Agent does the scene work? For that matter does Kara seem less stupid? I actually also saw Kara as messing around with the Children of Liberty and not that she seriously thought his name was really Agent Liberty. She just needed to irk them enough to get them to capture her. She’s at times naive but she’s not dumb. But you know, agree to disagree. Ok I admit sometimes Kara comes up with dumb stories/excuses like “flew here on a bus”. She’s not always quick on her feet. But I still feel this time she wasn’t serious.